this has already requested again and again, but i can't find it anymore and it is on the top things making me climb wall up in FZ. when you are using the 'select by criteria' palette on a day by day basis, it's just a pain to select any geometry 'by materials' attribute. the small scrollable window does just show tiny thumbnail without any text, and - as an icing on the cake - the order is even different than in the main material panel. see screenshot. please fix and enhance this, it's almost unusable at this point, but so important if you mass edit complex scenes! Please allow for the full Material palette access for selection by criteria. Sorry I removed this post because it wasn't very polite. Please see better phrased +1 below. Absence of a text option makes correct selection from many similar materials extremely difficult. This would make my life so much easier. PLEASE fix this soon. This feature has been severely lacking for quite a long while. A more robust solution would be most welcome. Hopefully this becomes a priority with FormZ development. Thank you! Yes, as far as priorities are concerned, this ought to be high on the list but seems forgotten as you say. My guess is that it will be a v9 feature. If so I would probably use it a lot more. 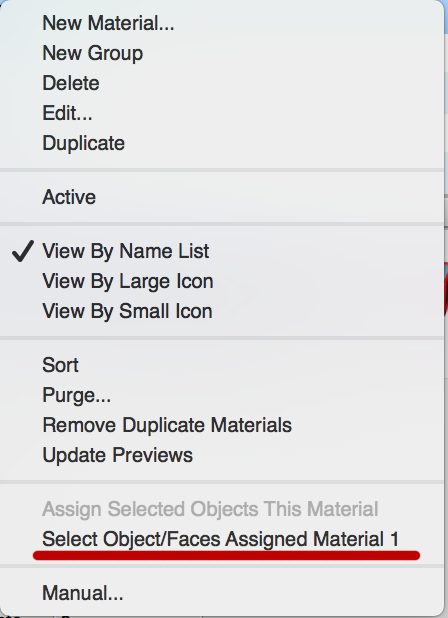 Please﻿ allow for the full Material palette access for selection by criteria.